Here are some of the things that can influence the bubble performance. Different detergents really make a difference! We prefer Fairy Ultra (and no other variants of Fairy). This brand was found best in a test made by Experimentarium. The softer water, the better mixture. Avoid water with much calcium carbonate. You can use distilled, demineralized or rain water. We normally just use tap water. Only mix and store your bubble mixture in a clean container. Impurities can decrease the quality of the mixture. The quality of the bubble mixture will decrease slowly with time (weeks or months). In dry air the bubbles will break quickly because of vaporization of water. For this reason it is best to make the bubbles where the humidity is high. If your bubbles continue to break even though you are using a good bubble mixture, it is most probably because of a too low humidity. A baking sun will also break the bubbles. I you make bubbles on a hot beautiful sunny day then make them in the shadows of buildings or trees. Foam consists of multiple small bubbles. 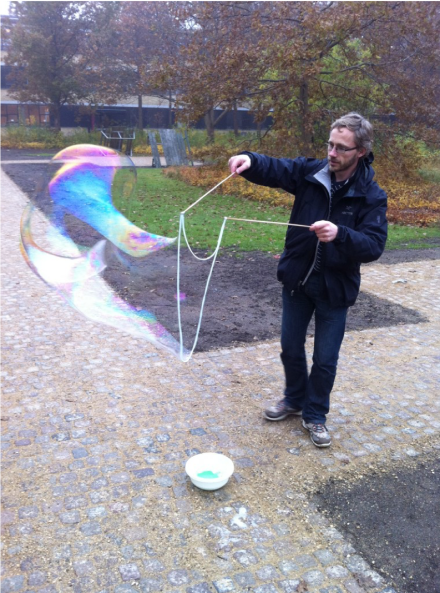 If you use water with foam, you big soap bubble will contain many small bubbles from the foam. If one of these tiny bubbles breaks, it will probably break your big bubble too. Therefore it is always a good idea to remove the foam from the bubble mixture when using it. If the bubbles are still misbehaving even though you have taken care of all the above mentioned, the problems can result from particles in the air, or from the technique or tools you are using.